This craft is done in the region of Mandvi and Mundra talukas of Kutch. Batik work is done by applying a resist of wax with wooden blocks or by brush and dyeing of the fabric. The units are of good size and carry out their own marketing. However the designs being done are the same from many years. A massive dose of new designs need to be created. 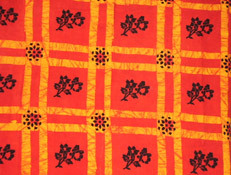 The issues of batik are similar to ajarakh block print and the inputs needs are also similar.